A first of its kind for South Africa! 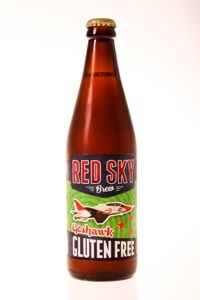 Red Sky’s Gluten Free beer is brewed in a Pale Ale style, using a combination of both Sorghum and Maize malts. This beer has strong passion fruit and litchi notes on the nose and palette. A surprising bitterness which is naturally found from the Sorghum comes through. The beer has a low malt profile, however is strong in fruity flavour, light in colour, often with a pinky hue. A very easy drinking beer, great for hot summer days! Drinkers should note that beer may be slightly cloudy due to the lack of filtration. Bottle conditioning the beer, gives it a very fine carbonation, often resembling that of a naturally fermented sparkling wine.